Mary-Elizabeth Ellard is a native Atlantan. She majored in religion and zoology at Duke University. She spent many pre-dawn and dusk hours at the Duke Primate Center studying the loud calls of lemurs. Her graduate research focused on dominance and aggression in Belgian draft horses. Dr. Ellard graduated from UGA with an MS in Veterinary Anatomy in 1987 and a DVM in 1992. She did her externship at ZooAtlanta. After almost twenty years in private practice in Atlanta, Dr. Ellard shifted her focus Atlanta area animal shelters. She currently serves as the veterinarian for Atlanta Pet Rescue and Adoption, provides spay/neuter services for Lifeline Animal Project and continues private practice relief services on the side. She deeply appreciates UFL’s Maddie’s Center for the excellent resources they provide shelter veterinarians. 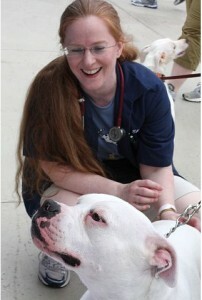 Dr. Ellard served on the board of the Greater Atlanta Veterinary Medical Society. She loves to cook and hike with her husband, Bill. She serves on the board of the Georgia Battlefields Association and speaks on veterinary medicine during the American Civil War. The Ellards live in the heart of Atlanta with their cat, Annabelle.